Well I did it again, the farmer’s market called to me, whispered through the wind, beckoning me……come hither Chef Dennis…..Now, let me tell you that if I ever heard the wind calling come hither to me my first thought would be that somebody slipped something into my brownies…….sigh…..but seriously, this time of year my first thought Saturday morning after my coffee of course is that the farmer’s market is open!!!! Yeah!!!!! And then I wonder what new and wonderful things I might find. Well this week I got a surprise! While paying homage to the zucchini blossoms (we eat zucchini blossoms just about every week, while we can get them) I spied something new……could it be……oh no I must be seeing things…..but yes it was true. I don’t even what to call them, but a wonder of nature. And here my friends they are. So off I went happy as could be, my treasure in tow! I did buy quite a bit of other goodies, Nectarines, Peaches and Plums…..oh my! Mushrooms, herbs, fresh cage free eggs, lemons, and limes. Why are lemons so expensive at the store, I just don’t know. These big juicy lemons were only three for a dollar! I got some regular blossoms too, I usually get 20 to stuff with my ricotta blend, and when I asked for some fresh blossoms from the truck he asked if I wanted the whole bunch for $5.00 (one dollar more than than I would have payed for 20 ) what could I say but yes!! Now I couldn’t just stuff my precious with the same ricotta cheese mix, Oh No, something special my precious deserves……mmmmmm……..crab meat. Not just crab meat, fresh lumps of blue claw crab meat blended with marscapone, and lightly seasoned……..that was an ahhhhh moment. Now as luck would have it I had shopped that morning and had already purchased a pound of fresh Maryland Blue Claw jumbo lump, it was a sign from heaven above, (make them and they shall come). So home I went salivating at the prospect of my new creation! I kept the batter the same, it turns out that my wife does not like the lighter batter, so who am I to argue. They really turned out well, I probably could have used more crab meat and less mascarpone, but they were light and delicious (and I had other plans for that crab meat). blend everything together and use a pastry bag (or baggie with the end snipped off to pipe the mixture into your flowers. 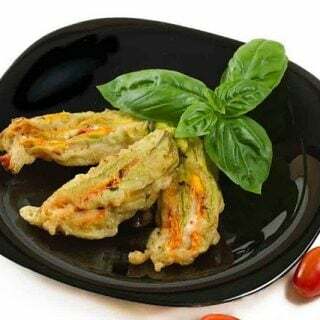 Lightly batter and sauté till golden brown (1-2 minutes per side), these may be held in a 200 degree oven till you are ready to serve everything…Normally I serve my zucchini blossoms room temperature, but if you like them warmer then hold them in the oven. mix all your ingredients together it should be the consistency of pancake batter, add more flour if yours is too thin. Every now and then I would mention a special dish that I would make when I was a restaurant chef, and it always elicited the same response…”you never made that for me”. So as a surprise I was making Steak Scampi for dinner for my carnivorous better half, (I don’t eat beef, so I had a chicken burger), this was why I bought the crab meat. I had a gorgeous little porterhouse that would be perfect for this dish (just a regular sirloin is fine, or if you want to kick it up do fillet medallions). So I got my steak out to let it come to room temperature before cooking, I wanted the steak to be nice and juicy, fired up the grill, and prepped the ingredients for my steak. When the meat was ready I seasoned it with a salt and pepper, I put it on the grill to cook. Then I started my shrimp and crab meat scampi. When the steak was ready it got topped with my scampi, a little bit of mozzarella cheese and then under the broiler to let the cheese melt. Needless to say it was a huge success, the intermingling of all those flavors just danced across the taste buds….I can always tell when its a great success, sometimes you here little moans and other times the knife and fork never stop and there is no conversation……this was one of those moments, she didn’t come up for air till the steak was almost done. My delicate little flower had eaten with the voracity of a starving lumberjack. My job was done! Grill your steak to your liking, and while the steak is cooking begin the scampi topping. In a sauté pan add 2 tablespoons of olive oil and begin to cook your garlic, when it has started to cook through add your mushrooms and shrimp and continue to cook. You want to be careful of overcooking your shrimp, once they are almost completely cooked pull the shrimp from the pan and set aside. Now add in splash of white wine, marinara, artichoke hearts, grated cheese and black pepper. Continue to sauté until it has all blended together. If your sauce looks too thick or starts to separate, add in a little bit of chicken stock or water, add in your crab meat and return the shrimp to the pan and remove from the heat. Do not over mix, it will break up the crab meat, just gently mix it together. When your steak is done return your scampi to the stove and reheat adding in your butter at this time (always add the butter in at the end of the sauce so you can taste the flavor it imparts). I then placed my finished steak in my sauté pan and spooned the scampi mixture over the steak and topped it with the shredded mozzarella cheese. It went under the broiler, sauté pan and all until the cheese had melted (if you don’t have all metal pans using a baking dish or pie plate). Plate up your steak with a spatula, spooning any of your scampi mix that was left in the sauté pan onto your steak . 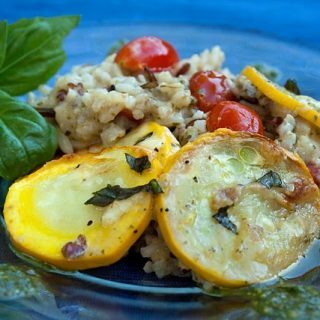 Garnish with Parsley or Basil and serve immediately! Now this is a great dish to make for a larger group, you can get a beautiful Tuscan cut porterhouse, say an inch and a half thick or two inches thick ( just grill it slowly, or even finish it up in the oven), two shrimp per person is good and increase your other ingredients proportionally………when you serve it slice your steak down and include some of the topping, and get ready for a lull in the conversation! Previous Post: « Salads, Muffins, and My First Give Away Too!! This looks amazing! A steak with crab? How can you go wrong? Those zucchini pops made my mouth water! I need to make them ASAP. Well, I am allergic to the crabmeat but I can imagine that it would be marvelous for those who are not. What an idea! Oh and those squash..almost too lovely to eat. Isn't the farmer's market the best?? Your creativity is absolutely amazing! Thanks for leaving a comment on my blog so I could hop over to your blog…I'm loving it so far! Good lord these look spectacular! I wish we had a decent farmers' market here in Houston. And thank you, thank you for the congrats. I'm glad you enjoyed the post; it means a lot coming from you. We've enjoyed following your blog! Your pictures are amazing! The colors are so bright. What type of camera are you using? those little squashes are so dang cute! I would be the same way…must have them! I don't know why lemons are so expensive either. What's the big deal? Okay, Sold! The Steak Scampi is going into my recipe box tonight. Lord my beating heart…what a combo. I feel like getting a fork and knife and eat the steak scampi off my laptop screen. It looks fantastic! Wow Dennis, those little zucchini pops are adorable, and the steak is to die for! Absolutely lovely photos and great recipes, as usual. All I can say is that this is the most scrumptious meal I've seen in a very long time. I see squash blossoms at the market but I've never stuffed them. There is no way I can resist your recipe so they are on the menu this weekend. Mouth watering post, thanks. That zucchini and steak looks absolutely divine, Dennis! Yum! I'm not surprised the wifey was over-the-moon – I would've been too! Awesome stuff. Love it. Congrats on your Top 9 the other day, too! Dennis that zucchini looks sooo good. And the steak scampi! I bet the wife was overjoyed – I think I would've been too! Congrats on your Top 9 the other day too, well deserved! There's nothing to dislike about this post. The colours in the pictures are fantastic! The zucchini pops are poster perfect! 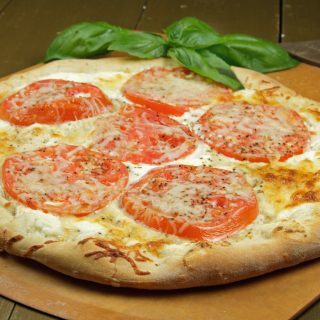 OK, Dennis, Congrats AGAIN for being #1 on the Foodbuzz daily list, and SUCH a delicious recipe and photos! I have yet to find zucchini blossoms here, and we never got around to planting our garden this year (just the herbs that always grow back no matter how badly we treat them)but hoo boy, if I ever find those babies, I'm a gonna get 'em! This looks absolutely exquisite. Wow. I loved the way you described this creation. I would like to make this for my wife someday. 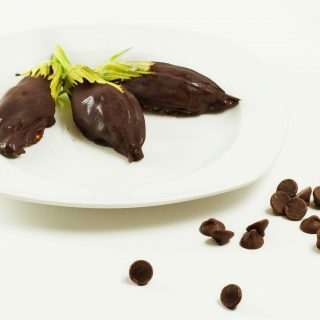 The next time we head out to Central or Dallas Market, I will be looking for the Zucchini blossoms. Oh Dennis Dennis Dennis!!! Those blossoms look to die for!! If you lived in So Cal, I'd be asking you if you made house calls!! You are teaching me wonderful new things. You are a genius! Both dishes sound and look terrific – and fun! I've just got to find me some squash blossoms. Thanks again for your great entry for the Smackdown. Next month's theme has been announced too, if you'd like to join in again. It still astonishes me how excited we get when we're about to create a recipe. You've done a fabulous job creating this meal right here!!! love the dish you made! yumms. make my craving go crazy now after looking at sooo many food bloggers!! A vegetable pop? And it actually looks good? Congrats and figuring out a way to make vegetables more fun. I can not believe how amazing both recipes look. 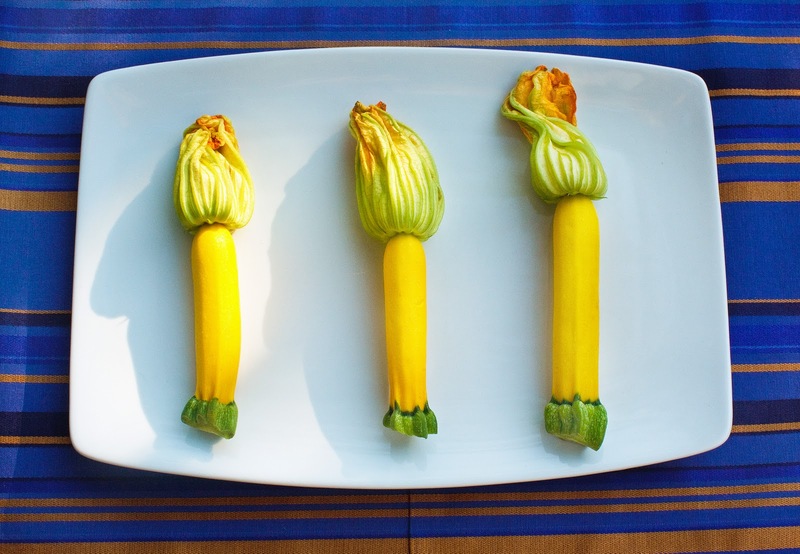 The deep-fried blossoms are gorgeous atop baby yellow squash; and the steak scampi? Well, lets just say both recipes are now printed out and ready to be played with in my kitchen. Thank you for sharing such fun food ideas! Nicely done Chef Dennis! I have never eaten a blossom but they sure look good. I am a meat and potatoes girl so the steak scampi looked amazing! my husband and I are the same way I eat beef, he prefers not to! Your pictures look so amazing and fun! I've been fortunate to go crab fishing in Maryland and caught 6 gargantuan blue crabs. Being pastry I wasn't exactly sure what to with them, and I wish I read this was around back then! Btw the steak scampi made me salivate. You are seriously one of my favorite food bloggers! Wow ! This is beautiful and has me running out to the garden to see how many zucchini blossoms I have. Your blog always knocks me out-such beautiful photos , humorous writing and your recipes-mouth watering delicious..I can't wait to make this dish this week-end ! Wow, beautiful! I have some crab meat waiting to be used, as well, but I couldn't have done anything as marvelous as these. Great job…again! The blossoms enough would make me swoon. The addition of the attached squash is causing a double swoon, and the crab meat stuffing?!! Oh dear. Why are you doing this to us? Too much goodness at once. Chef Dennis, you're my zucchini god, you always make amazing stuff out of zucchini. Both of these dishes look amazing! I am dying to eat a zucchini blossom. On one hand, I'm scared (cause it is a flower…) and on the other hand seriously intrigued. 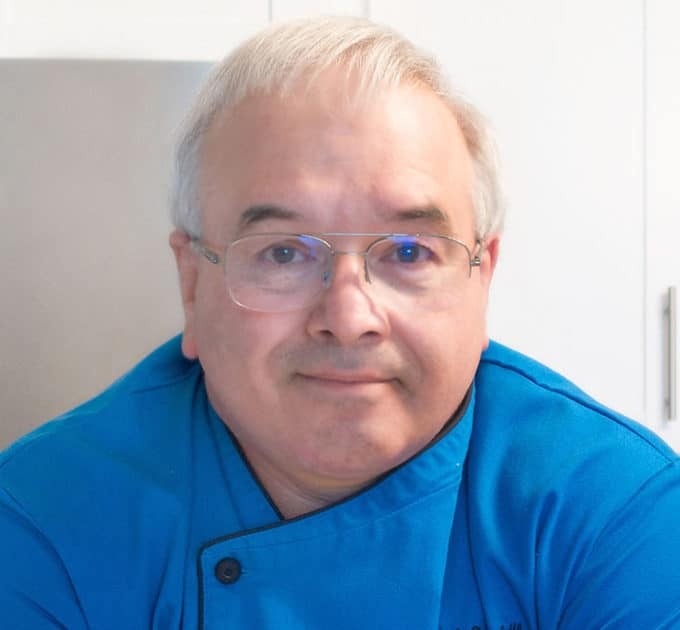 Chef Dennis I do so enjoy your writing. You paint a vivid picture of emotions and still keep it light and witty. 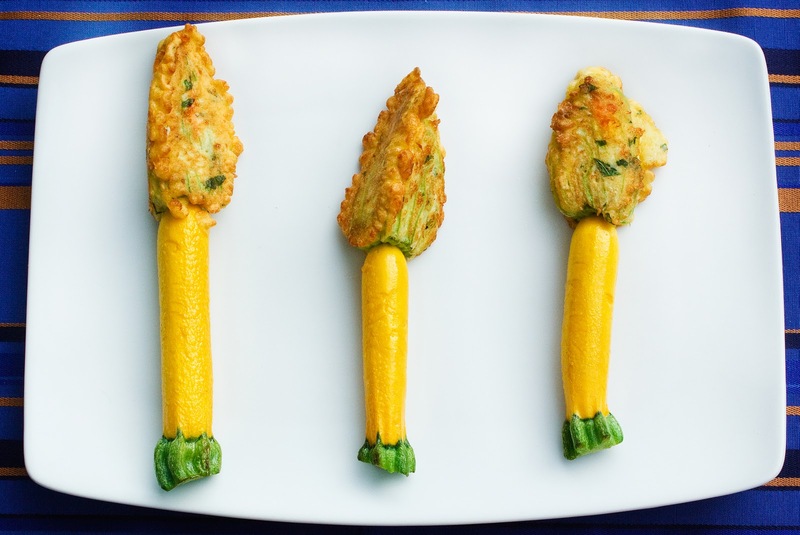 These zucchini blossoms are little torches of deliciousness. What a pleasant surprise to cut into those blossoms and find that delicate blend of crabmeat stuffing. Oh dear. I think my mouth is watering. And its not even 8:00 am. Amazing!!! Love this dish so much. It's looks so cool! 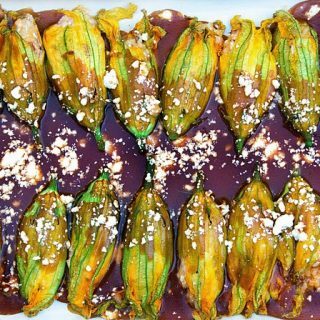 This might sound like a dumb question, but aren't those flowers on top of your zucchini?? We have a garden and that looks like the flowers that bloom before the squash starts to grow!! Yikes, I need some culinary education. The farmer's market gets me out of bed on a saturday morning also. I usually just attribute the voices to a hangover…but maybe it's really just the gods of fresh produce speaking to me. Those zucchini are the cutest! now I MUST HAVE THEM. Oy. Beautiful! 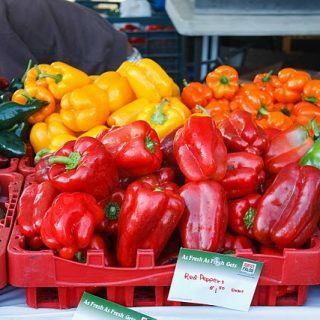 I can't wait to go to the Farmers market and get all ingredients to cook the lovely dish. mm! Culinary Smackdown results up (finally!). Thanks so much for your terrific entry, Dennis, and your ongoing inspiration, plus your patience in my announcement of the winner! Thanks for playing! Wow great find! I've never seen anything like it. Wish I could have experienced that meal! 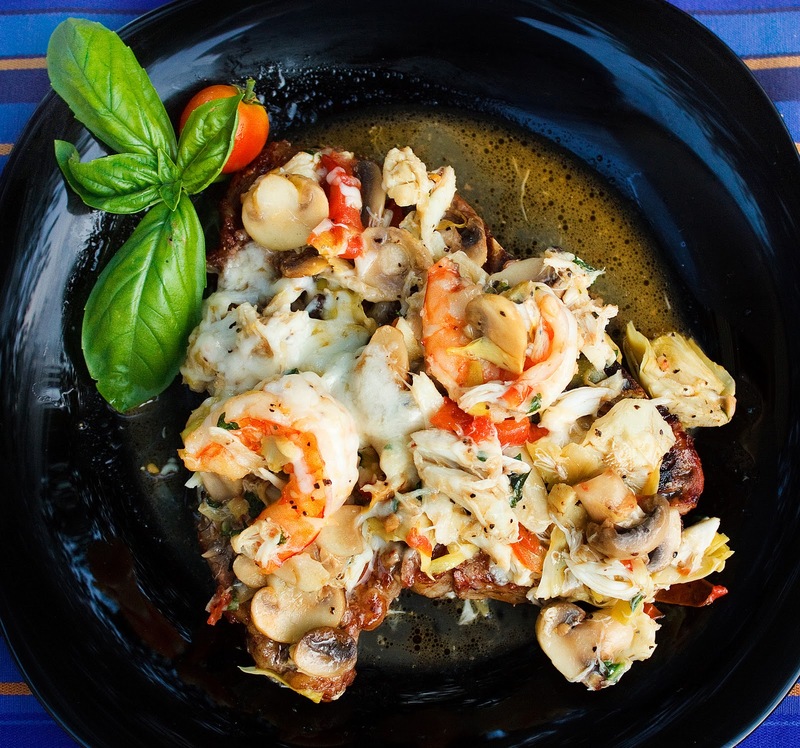 Madness… divine madness.. steak scampi… how did you think of it???? brilliant post and fab photos!! !